Add style to your garden and attract hummingbirds with this stylish feeder. With its Early American look, this glass feeder is reminiscent of bygone days. 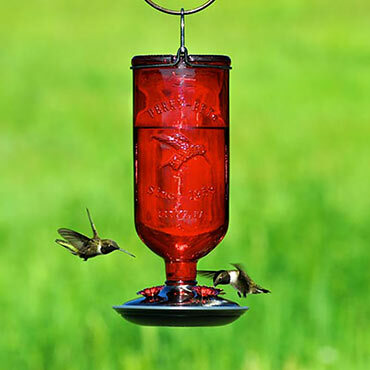 Its dark red glass nectar reservoir is embossed with a hummingbird in flight. This functional feeder has four shiny red flower ports for feeding and a 16-oz. capacity. 10½"H x 5"W.